Are you sick of having 2,781 variants of a Speyside whisky and being told you have to drink them neat / with a drop of water / only at 500 feet above sea level and 60 percent humidity by one overbearing snob and then tutted at by another if you hold the glass by the bowl? If you are, this is for you. Whisky, or any other spirit, for that matter, never had the pressure to win multiple awards or gain traction on social media back then. Suffice to say that some of the best (subjectively speaking, of course) whiskies were simply made, and made simply. Like all forms of appreciation, there comes a point where it all gets a little silly. Then like a game of habitual pong, we kind of take a step back and head the other direction. Mixing your aged spirits – especially dark ones like cognac, rum and whisky, will typically evoke gasps of indignation, especially so for more expensive tipples that have been aged for a considerable amount of time. The adage that it’s wasted when mixed isn’t unreasonable, as sometimes the scarcity of the spirit would dictate how you should best make the most out of a limited quantity, but to suggest that there can be no instance where mixing it is a legitimate means of consumption, smacks of snobbery – who died and made you the Grand Poobah? We’ve heard it all before, and we’ll never hear the end of it; we’re not saying that you have to drown a rare dram of Largiemeanoch with cola, but sometimes it’s okay to lighten up and mix your whisky, or for that matter, any good spirits with quality mixers to change things up a little. And to open up your horizons – think of it as a bit of education. If you don’t like it, you don’t have to do it ever again. Some of us may have had the experience that it’s rubbish – after all, why would whisky coke be a good idea – apart from a time many years ago where whisky was just another carrier for alcohol, and taste was judged on your assessment of the opposite gender? Okay, never mind, scratch the last part. But there have been signs in the industry – especially for scotch whisky – of producers starting to present their products in this ‘format’. Glenfiddich Live, which kicked off last year, was designed to show drinkers a different way of having their scotch. And more recently, Georgie Bell had also been advocating the whisky cocktail as a way of making whisky more accessible, if done right. This is where Fever-Tree comes in. 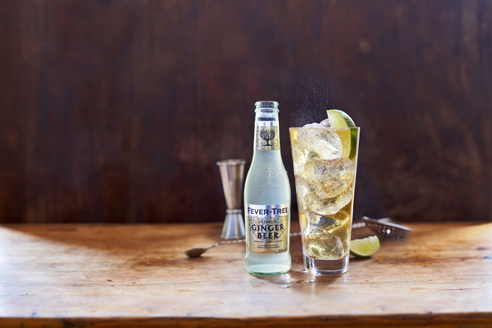 Fever-Tree has been around for ten years or so, pioneering and supporting the appreciation and use of well-made tonic water in cocktails, and in helping good ol’ gin and tonic be what it is today. These days they’re more intrigued by the growth and development of mixing with aged or dark spirits like cognac, whiskies and rum and all the changing dynamics that is happening. Before Andy Gaunt ventured into the world of cocktails, he used to be heavily involved the Whisky business at Diageo – so he knows a thing or two about what drinkers of aged spirits would think. Now his business involves trying to change public perception of what is acceptable and more importantly, why it is more than acceptable. “We have a range of mixers in our portfolio that we consider to be very well suited for the dark and aged spirits. And to help with that we have a couple of other products that we’re bringing out this year, so this an opportunity to talk about that side of the business,” Andy explains. Fair warning – pretty long interview ahead, but at least it’s not a boring one. What made you decide that this is the time to have this range? Probably the best way to answer that question is to start at the very beginning of our story, I think. 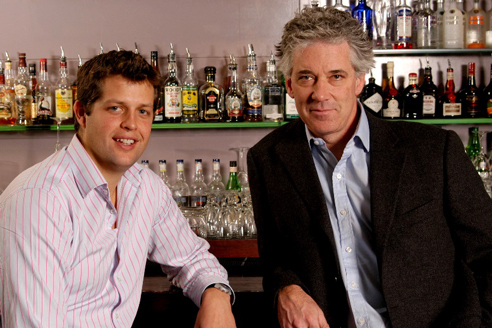 We were founded some ten-eleven years ago, and we were founded by two gentlemen: Tim Warrillow and Charles Rolls who met each other in a pub in South West London, and good ideas often start over a beer or something (of the sort). Tim was actually working in the food industry; in marketing and advertising for luxury foods, and was a big gin and tonic drinker. In England, people drink a lot of gin and tonic and he was noticing that how people were more interested in quality. And he felt there was an opportunity to create a better quality gin. Charles had a reputation that he had established for himself as he had taken Plymouth Gin – a bit of an old-fashioned brand in the 90s, turned it into a very modern (brand), and it got sold to Pernod Ricard. So he’s seen as an expert in gin, and they met really, to have Tim take advice from Charles about gin. 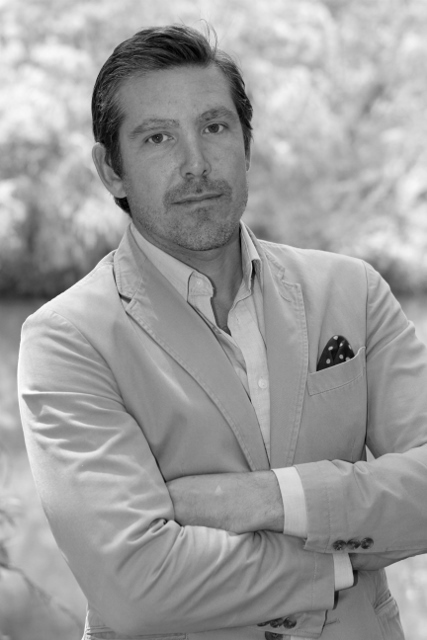 During that meeting, Charles said that one of the big issues is: when he makes a gin and he makes all of this effort in distilling, sourcing botanicals, and he tastes his gin neat at room temperature, alongside all of the other gins, he can see big differences in quality and flavour. The problem is no-one drinks gin like that. They drink it drowned in artificially flavoured, artificially sweetened—crap basically. It just ruins all the hard work and that point they said: why does nobody introduce a range of mixers that are designed specifically to enhance the flavours of a great spirit? And they very much go back to what mixers were originally, which were naturally created, high-quality products. Over the last 50-60 years, the retailers, the supermarkets have just driven the price down, and we end up with products that are not of great quality. They’re OK, but they’re not the best that they can be. So that’s the idea of what they wrote down on a coaster at a pub in London. If three-quarters of your drink is the mixer, make sure you use the best. And that sort of started this journey, if you like. So how did they get started? They spent a good 18 months researching the opportunity and actually understanding what makes a great mixer. And there’s a few things that make a great mixer. One is, ensuring that your flavour profile is actually going to complement and enhance the flavour of the spirit and not hide it, so that means removing all artificial sweeteners and particularly, artificial flavourings that can create a like sticky feeling in your mouth and that can hide the flavour. It also meant looking at carbonation – the bubbles. We like drinking carbonated drinks because they make us feel good when the CO2 bubbles burst in our mouth. Soft drinks like to have great big bubbles because it makes you want to drink more. But if you like to drink food and wine, champagne is a really good wine to have with food because it has really small, soft bubbles and they carry flavour through the carbonation. But no one else was creating mixers. They were creating soft drinks that also had a role to play as mixers. So when we created something that was really designed to make your spirit really stand out one thing we noticed was that the bubbles are quite different. Very high carbonation, but very soft bubbles. We’re using natural quinine, which is the bark of the Cinchona tree and gives us that bitterness, and we’re using some Tanzanian Orange Oil, natural cane sugar. The difference, really, is keeping it clean, keeping it fresh and having water that has clean mineral content. So what triggered the crossover into dark spirits? We started off with our tonic water – that’s proven very, very successful – and I guess the natural progression was recognising that gin is only three or four percent of premium spirits consumed worldwide. Eighty-six percent is whisky and cognac, rums and American whiskey, and people drink these mixed. And so that led us into that phase. The gin boom in Europe started ten years ago. What we were seeing were craft distilleries and people being interested in higher quality products wanting to trade up to better quality spirits and there was really only one ubiquitous choice for the three-quarters of the drink that is the mixer. And we’re using the same thing now in dark spirits in the last three years. Craft distilleries have grown by 300 percent, and half of those are whisky distilleries whether American, Japanese, even scotch; very small, artisanal, and of course all the existing whisky companies, cognac companies been really focused on quality. (There are) People (who) still like to drink their dark spirits mixed, and neat drinking is still relevant obviously. So we felt it was a similar situation. There are really only one or two ubiquitous choices, and people are just not aware there is a better choice. You’re spending good money on a whiskey that’s been aged in oak barrels and have taken all that wonderful flavours. We want to make sure that there is now a range of products that can help create much better tasting drinks. That’s sort of the beginning of that. When you have so many possibilities, how do you decide on a product that you want to focus on? That’s the heart of this opportunity that we’re looking at with dark spirits because as people are more interested in whiskies than ever before, at the same time there’s a lot of interest in all sorts of things, and I think for a lot of whisky companies the question is how do we ‘recruit’ the younger people who are just starting to enjoy drinks in a more responsible way? And sometimes mixed drinks and cocktails play a role in that as well as the neat spirits. 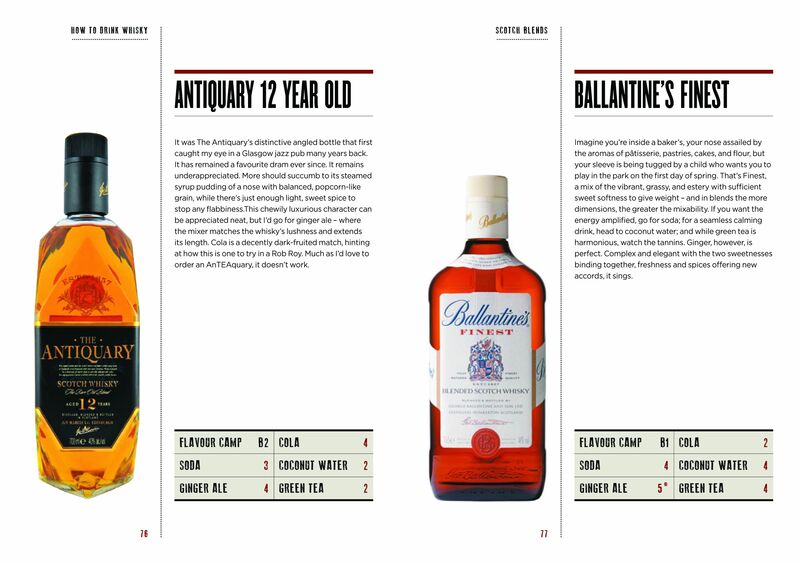 Dave Broom is one of the most respected and progressive whisky writers today – the manual actually describes how various whiskies fare with the most popular mixers available today. Do you know a whisky writer by the name of Dave Broom? I have a picture that reminds me of a quote – which I think is a great quote from Whisky: The Manual. It goes: “Ginger is the Rita Hayworth of the mixer world. There’s a smouldering, seductive aspect to ginger, which then ignites into spiciness on the kiss-off. Agreed. And highballs aren’t exactly new either, right? Back a hundred years ago, when whisky was having its first boom, people drank whisky mixed. They drank it with soda water; they drank it with ginger ale. And particularly ginger, because ginger is a natural flavour enhancer. We use it in cooking, not just because it has its own flavour, but because when it’s added to other flavours, it lengthens flavours, and it boosts flavours. So a hundred years ago you had these great whisky and ginger ale drinks that allowed you to taste all the complexity of the whiskies, but with the refreshment (factor). And actually, you can argue that it has a more enhanced flavour because ginger brings out flavours even more. The issue today is exactly how gin and tonic was ten years ago: there had not been any choice in ginger ale. First of all, ginger ale uses artificial flavourings, or chilli, or capsicum, to give that spice effect. 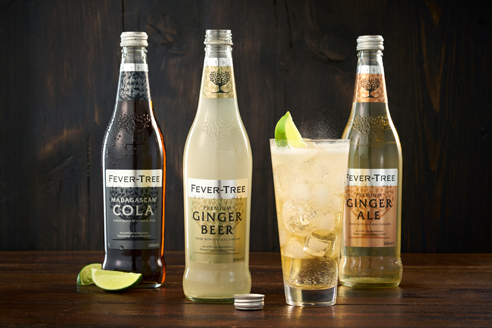 So what then, does Fever-Tree use for its ginger ales? We worked really hard to try and get this right. 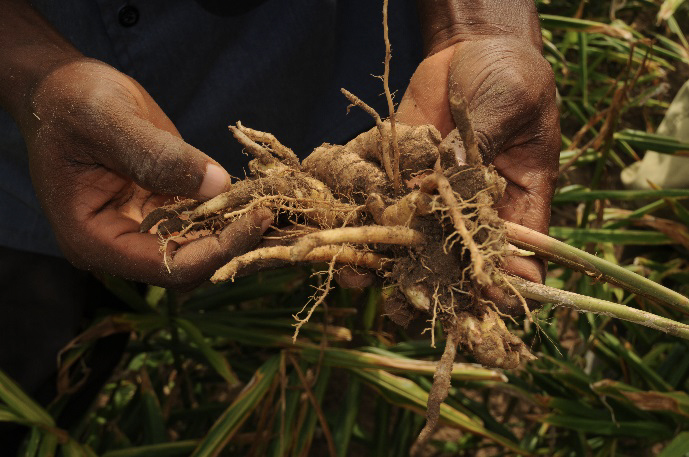 To do that we travelled, really, all around the world to get the best possible ingredients to craft our ginger ale. We also had this ginger from Cochin in India. And this is a very different ginger. This is more like a chocolatey ginger, so this can work really well those lovely rich, flavours of whisky that have been resting in oak and taking on those delicious base notes – if you like, like the bass notes of a music orchestra. And then finally, there’s a ginger from Nigeria. An intense, aromatic ginger. More earthy, more like a root ginger. And that again brings an opportunity to work with all those lovely spicy flavours. So the ginger ale is a blend of these three and a little bit of cane sugar and carbonated water; it’s very simple. And that was the beginning, if you like, of that journey. The journey into dark spirits, you mean? What’s happening in drink trends right now is that aged rums are starting to get really interesting and so a lot of whisky drinkers, ex-cognac drinkers are now taking notice. It’s incredible when you look at the versatility and range of flavours now from the sweetness of bourbons, the Japanese whisky style; just within Scotch itself obviously we’ve got the peaty and smoky, right through to the islands, the Speyside softness, and rum brings another dimension. There are some classic ways of drinking rum – take Dark & Stormy, which is very simple rum and ginger beer. So (we take) the ginger beer that we have – the same three gingers, but we’re using a brewing technique. So just like brewing a cup of tea, the gingers are actually macerated into the water whereas with the ginger ale it’s a bit lighter as the oils are infused into the water. It’s a spicy ginger, so it’s a bit more punchy than the ginger ale, and it sort of allows us to offer an opportunity for bars and people that enjoy darker spirits to have a range of different, refreshing drinks. And if you like, the classic soft drink of a ginger beer. On the topic of versatility – whiskies, in particular, are finished in many types of casks. Wouldn’t that open up the possibility of flavours clashing? I think we’ve really seen in Asia that (there’s) interest in Sherry casks – Macallan obviously, was the big innovator in that space, and now a lot of the other Scotch whisky companies are looking at wine barrels to finish their whisky. So when we looked at that, we thought of all these flavours, and many of these different flavours were developing during maturation, which itself is already a fascinating space; because you’re bringing many different products to the fore, whether it’s European oak or American oak (matured), or finished in different casks. So just to have one ginger ale we felt was not really doing enough to allow us to enjoy all of these great, great drinks. And we’ve learnt from gin and tonic because we have created five different tonic waters to complement the world of different gins and that’s really helped to grow the category and interest in it. You can now have your favourite spirit matched with your favourite mixer, rather than to be stuck with one type of mixer. So that’s the next step, and that’s what we’re really unveiling later this year [ed’s note: already released] – these new ginger ale products that we designed to work with these new flavours of whiskies. OK, that sounds cool. What are these variants? So the first one – and I’m really excited about this – is what we call our spiced orange ginger ale. So in here, we’ve got the same three gingers that we had previously, but we’ve incorporated into the blend some clementines from South Africa. These lovely, juicy oranges, and cinnamon, from Sri Lanka. As many a chef would say, Sri Lanka is home to the best cinnamon. And the reason for that, I guess, is when you think about some of the flavours that we enjoy in cognacs, in lighter and sweeter whiskies, you get how important these pieces of orange are in bringing out all of these wonderful flavours. That fresh orange of the clementine and the spice of that cinnamon are really (good) flavourings for darker spirits. It’s a delicious flavour, and it’s what we enjoy. Some of it is about complementary, some of it is about contrast. So, if you really like a smoky whisky, putting the spiced orange ginger ale with a smoky whisky is about complementing but also contrasting flavours at the same time. Having said that, VSOP cognac, with our lovely sort of sweetness, balances really well with this, because the orange is bringing out the sweetness and enhancing it. Without being too complicated, it’s allowing everyone now just to able to have a look at their favourite aged spirits and actually think about the mix, which is actually such an important part about enjoying a drink. The second one is what we call a smokey ginger ale. So this is a product that – we’ve incorporated applewood – we use a smoking process, like how you might smoke bacon or meat. So we’ve got the smoked applewood, we infuse the smoke into the water, and then we blend our gingers again. So this is – talking about contrasting – taking a sweeter whiskey like a bourbon and mix it with this to get a lovely, lingering smoke. Or you can add it your favourite peaty whisky and have sort of an enhanced, smokey experience. So for bars and for the home, to be able to have a range of dark spirits and three different ginger ales so you can mix and match if you like, we think is a really exciting opportunity for the industry and it’s never been done before. So I’m really excited about that. So how did Fever-Tree settle on its ingredients? 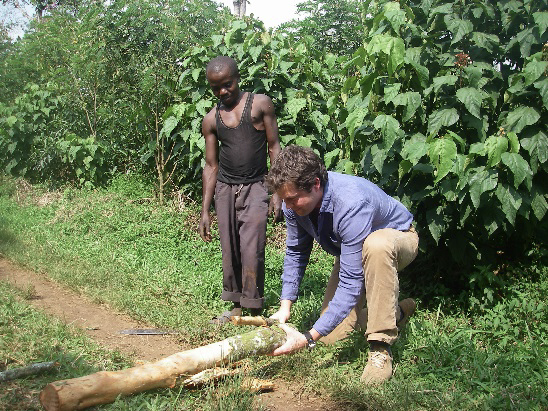 So it was quite a long process – a lot of travelling to different parts of the world; Tim and Charles personally visit all of the different suppliers. Once we find the ingredient that we like and we’re gonna use, often we extract the oils from these ingredients and those would be done at source, and then the oils are brought into the UK, where we assemble all of our products. We add all the carbonation and we do all the bottling in the UK. We have a very close relationship with all of our suppliers, and once we find those ingredients we like, then they’ve been long-term partners for us. While Fever-Tree is a product that might have been born in the UK, it’s a product that’s actually made from a passion to go to the ends of the earth to find the finest ingredients from really, all over the world. How long did it take for you to get to this point? What with the range of products and all the sourcing that you needed to do? The process, really, for the whole range, has been ten years in the making, I guess. We launched our first ginger ales and ginger beers originally about seven or eight years ago now. We tend to find that most of the research and development is about 12 months, as we sort of spend time to explore the ingredients and get the blend right and then we signed off the recipe at that point. 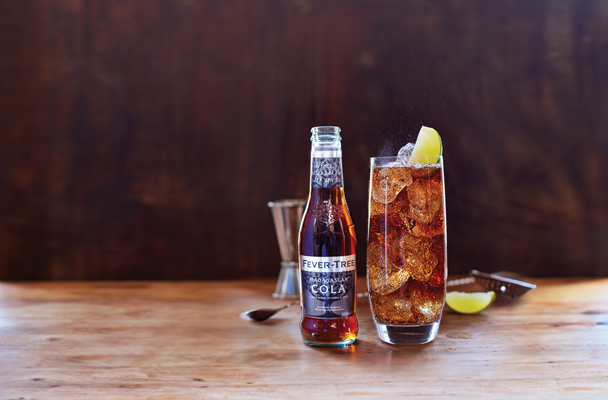 Quite recently we introduced into the range a cola and cola is a very common mixer for many dark spirits. You can get bourbon and cola; Cuba Libre – rum and cola – is a classic cocktail. That was about two years in development because we knew we’re not trying to be a soft drink to compete with Coca-Cola but at the same time, people do have a perception of the flavour being something like Coke. So the teams spent a lot of time in working with many of the whisky companies including Diageo, to learn what happens. The science of maturation – what flavours are taken out of different woods, and that actually led to the development of the botanical mix. We have 12 different botanicals in our Cola, (which includes) nutmeg from Indonesia, cassia bark, cinnamon, cardamom seeds from Guatemala. When we started identifying these movements in darker spirits – the craft distilling interest, the consumer’s interest in more diverse flavours of whiskies, and recognising that people still like to drink refreshing drinks and the fact that there’s no choice – we felt there was such diversity of flavour that we needed to have that range. Did you work closely with Diageo again for this? Not so much. We have a very good relationship with all the spirit companies. They have seen many benefits. 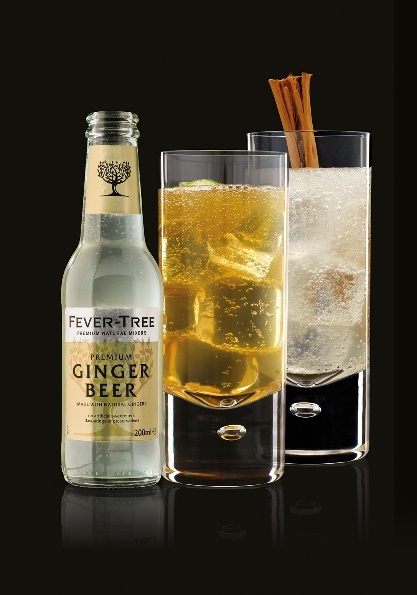 We’ve seen over the last ten years when good quality spirits are paired with Fever-Tree, sales actually increase. Whether that’d be in a bar, so if a bar were to range Fever-Tree, instead of more mainstream mixers, we’ve seen very, very frequently, an increase in sales of spirits. We believe and we sort of know that’s because the guests had a drink that tastes more natural, that tastes fresher and even though it costs a bit more, they think it’s worth paying more, and they buy more. So you can imagine the spirit companies, as well as the bar owners, being very happy with that as it helps the perception of their products. So we worked very closely actually (with them) in the development of these gingers with several whisky companies and cognac companies to take their feedback. We have changed and adjusted the recipe over the last six months based on feedback from some of the spirit distillers, which have been really helpful. With such a wide range of ginger ales – did you have a particular spirit in mind while developing each of them? I think we had a start point in terms of flavour style. One of the things we actually do to help our bars is that we have a pairing map – a flavour map. So we started off saying American whiskies have this sort of a sweetness that complements a cola-type of flavour because those vanillas – and we use a Madagascan type of vanilla as the heart of the cola – really works with the butterscotch and caramel flavours of American whiskies. And then we have Scotch whisky with the spicier, smokier sort of flavours, and that’s where ginger ale really works. And then we have the sweetness of the cognacs that work with ginger ale, but that’s also where soda water starts to ‘cross over’. So you get these sort of high-level flavour matches. But then when we looked at the new ginger ale range and we got a little bit closer in, the contrasting pieces form an important part to the sweeter, more citrusy or orange citrus of cognac, and was sort of a start point for thinking about our spiced orange. Think about how great a glass of cognac is with a wedge of orange in or an Old Fashioned with a slice of orange as a garnish. And then with a smoky style, we’re looking at two angles, to be honest. We looked at the sweetness of American Whiskies and some of the Speyside, Highland styles of whiskies. A bit of smoke can bring a nice warming effect. So it’s a simple flavour map, but it allows us also to be quite playful and try around different things. Was there any particular mixer that felt a little more challenging to concoct than others? I think getting the smoke right was a bit of a challenge. Because smoky can be a bit overpowering and we obviously weren’t intending to create a ginger ale that was just to reflect the flavour of peated whisky by any means at all. But we felt that there was something in that the lingering smoke – a lot of aged spirits mature in barrels that had been charred, and that charring on the inside, while it’s not creating a smoke flavour it’s creating an important flavour. So we felt that a smokey ginger ale would help bring that out. Just trying to get the smokiness right was a challenge and we ended up with smoked applewood as the way of doing that, but there can be other ways of doing or creating a smoke effect. So that was probably the one that I think the team enjoyed, I should say. Like everything, when creating cocktails or recipes it is a bit of trial and error; between the ratios a lot of tasting, particularly because we balance our mixers to work with spirits. They’re delicious as soft drinks – that did require some experimenting, which is maybe the fun part as well. So which of these are you particularly happy with? Do you have any serving suggestions? I’m really excited actually about the ginger ale. Because it really is the ultimate highball. The soda is diluting the whisky a little bit, which brings out more flavour, and it’s creating refreshment. Ginger ale is soda water that has had real ginger added to it. So it’s still doing the same job as a highball, but by putting ginger in, we’re also bringing out the flavour of the whisky. So I think if a highball is interesting, the ginger ale twist is really the way forward. We can use a classic Singleton with ginger ale and as Dave Broom said, ginger ale is whisky’s greatest mixer; it was one of the most important mixers in the 1900s, especially to drink with whiskies, and we’ve all forgotten what a great mixer it is because there have not been real ginger ales on the market till recently. But that’s sort of where it starts. If you want to wake your palate up after a day’s work, or its the beginning of the evening, rum and ginger beer is just a refreshing drink. Then you can have a Japanese whisky – a Nikka for example – and soda. I’m sure you’ve seen the growth of a highball: a highball being whisky and soda, or a spirit and soda. When we incorporate Fever-Tree with that very high level of carbonation and more champagne-like bubbles, it creates an elegant highball as the flavour carries really well. And there is the cola. Cuba Libre, which is a classic rum and cola, but hopefully you’ll feel it’s a lot cleaner, less sweet; you get vanilla, the caffeine, the roasted barley in there, and it’s very different from something like coke and Pepsi with all of that sweetness and preservatives. It’s a vanilla-forward style of drink. VSOP with spiced orange (ginger ale) actually makes for quite a complex drink. It almost tastes like a well-crafted cocktail. We sometimes say that spirits and mixers are maybe not the drink to have because we think it’s not quite going to be complex enough to really enjoy a great aged spirit. But this has really got real complexity and it feels like something a bartender could be making. (Now) I think I could make that at home without any experience at all. And then finally, you’ve got a bourbon and a smoky ginger ale. So it’s sort of allowing the versatility of those gingers to bring out the sweetness and that smoke has that sort of lingering softness. It’s quite interesting. Our hope, I guess, is to have a complement to those spirits and to the bar experience, but also at home, and it is about recruiting people into enjoying these sort of drinks and helping the categories keep alive and interesting while there is a great interest in these artisanal, crafted spirits. I think a lot of whisky drinkers would not have expected to have a good experience mixing their drinks. It’s a nice surprise. It’s very exciting, isn’t it? I draw some parallels to gin and tonic, which has become very trendy here over the last couple of years and the growth of gin around the world for the last five years has just been phenomenal. It’s our belief that a huge part of that is (down to) people who didn’t think they’d like gin and tonic – what they didn’t like was the tonic water. As soon as you put a premium tonic water in that, it’s ‘wow, this is tasty’. The industry has grown much because of the gin, but equally as important is that there is now a choice in tonic. Obviously, we have a job to let people know that flavour and complex taste can be achieved with a mixer and as I said earlier, this is really important to us. But still, a lot of people are sleepwalking when it comes to the mixer. So we do things that are quite new and interesting for the whisky and cognac drinking consumer to enjoy. And also you don’t have to spend a huge amount of money on a complicated whisky cocktail whereas the price point here shouldn’t be any different from a gin and tonic, which in Singapore is obviously not cheap compared to somewhere else. But relatively speaking, it also makes it more affordable to enjoy the wonderful flavours that the distillers and blenders are creating all over the world. Yes, you have, and certainly no shortage of choices here. 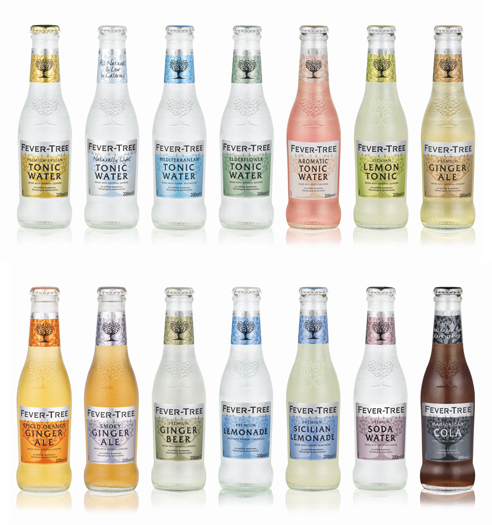 I’m very happy with our distribution and the availability of Fever-Tree has grown very nicely in Singapore. It has given people more choice and once you’ve experienced it; once you’ve been lucky enough to sit in a business class seat in an aeroplane, it’s hard to go back to economy again after you know what it’s like at the front. It’s a bit like that with this as well. I find it very difficult to drink a spirit and mixer now with some of the other products because I know how good it can be. Will there be more flavours to come? Well, we’re always excited about innovation. It’s really what’s growing our business. Tim and Charles and the team in London have quite a variety of projects that we’re constantly looking at to see what we can do. For many people, these products are going to be completely ‘new’. So while we’ve had this on the market for a while – people know us for our tonic water – and we do have the ginger beer and ginger ale available in bars across Singapore. But to most, even these are still quite new. The Cola is something we’ve only brought in last year, and we’ve just worked closely and ‘softly’ with some of the bars. So this is the first time we’re actually talking about the Cola and the two new ginger ales. Personally, I’ve been rather impressed by this cola. And I would never have thought I’d say a thing like that. We’ve had very, very good reaction to this cola. And after years and years and years of people not having any choice, and it was just sort of, for me: why has no one done it before? Why has it taken us to 2016 or 2017 to come to the market with a cola? We even say on the bottle: ‘Perfectly balanced for dark spirits’. I mean, really, this is all about learning about maturation and trying to create a cola that could work with those. I think we’ve done a pretty good job. But we are looking at other opportunities and all over the world, really, just to ensure that we continue to bring something interesting into the mixer category. Ultimately, that’s because for 50, 60 years, nobody’s talked about mixers – it’s been stagnant; it’s been dead of innovation. And it’s only been the last, really, six, seven or eight years that Fever-Tree has led that development. When we think of spirits, twenty to thirty percent of all spirits are premium priced spirits and above. In mixers, 98 percent of all mixers are just cheap, value stuff. So, we’ve got a lot to do just to bring more choice and innovation, and new products are part of that. Fun times ahead!